A large part of our research effort is on shallow-water carbonate systems, and careful petrographic analysis is needed in order to fully understand the depositional environment and diagenesis of these rocks. 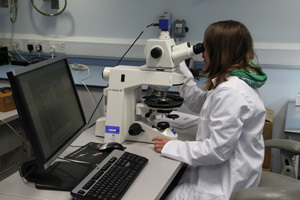 We therefore operate a number of different microscopes. The Zeiss Axioscope 40 is a research-grade petrographic microscope equipped with a polariser and a digital camera (a Zeiss AxioCam). We also purchased the AxioVision software, allowing us to do image analysis and automatic estimates of porosity in thin sections. Cathodoluminescence is a technique in which polished rock stub or thin sections are submitted to an electron bombardment under vacuum. The electron excite reactive chemical elements within the carbonates such as iron and manganese, and each mineral phase luminesce with a different huh depending on its chemical composition. 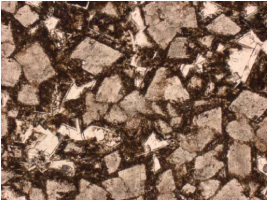 This technique is very useful for diagenesis as it allows the distinction between various cement rims, and can help in the identification of the environment of diagenesis. 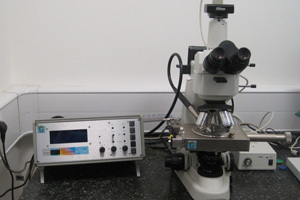 We use a CITL mk5 cold cathodoluminescence stage mounted on a Nikon 50i microscope with a Nikon digital camera. The carbonate group has access to a wide array of visualisation techniques at the Natural History Museum of London: a collaborative research agreement exists between the NHM and the department of Earth Science and Engineering at Imperial College. 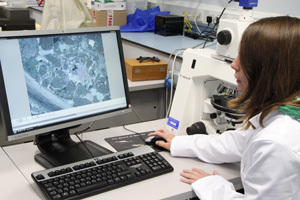 Techniques available for our research include microsondes and scanning electron microscopes.